Biography of French Romantic Artist, History Painter. See also: Best Artists of All Time. Arguably the most influential artist of the 19th century, and undoubtedly one of the best history painters of the modern era in French painting, Eugene Delacroix was also the leading figure in the French Romanticism art movement. With images created solely out of glowing colour, he deviated from the "official" style of neoclassical academic art as embodied by J.A.D.Ingres. Furthermore, his passionate brushwork had a significant impact on the style of Impressionism, and his experimentation with exotic subject matter inspired exponents in the Symbolism movement. He was influenced early in his career by French Romantic artists like Antoine-Jean Gros (1771-1835) and Theodore Gericault (1791-1824), as well as English landscapists such as John Constable (1776-1837) and Richard Parkes Bonington (1802-28), and portraitists like William Hogarth. His best-known works include The Massacre at Chios (1824, Louvre), The Death of Sardanapalus (1827, Louvre), and Liberty Leading the People (1830, Louvre, Paris). In addition to his easel art, which included portraiture, landscapes and still lifes, Delacroix was a master of mural painting, as exemplified by the central ceiling of the Galerie d'Apollon at the Louvre. Born at Charenton, near Paris in 1798 it is believed his father was infertile, and his real father may have been the renowned diplomat Charles Maurice de Talleyrand, who was later to become Prime Minister of France. Delacroix certainly resembled Talleyrand in looks and character, and Talleyrand went on to protect the artist throughout his career. Delacroix was educated at the Lycee Louis-le-Grand, where he learned the classics and won awards for drawing. His uncle, impressed with his drawing, encouraged him to study art at the Ecole des Beaux-Arts, in Paris. In 1815 he entered the studio of artist Pierre-Narcisse Guerin, whose neoclassical painting was in the style of Jacques-Louis David (1748-1825). His early works from this period show influences of Raphael and Rubens, in colour and style, which can be seen in two works of religious art, The Virgin of the Harvest (1819, Orcement Church) and The Virgin of the Sacred Heart (1821, Ajaccio Cathedral). Around this time, he befriended the artist Theodore Gericault, and the populist Paul Delaroche (1797-1856), two other leading members of the Romantic movement in Paris. It was Gericault's famous work, the Raft of the Medusa (1819, Louvre) that inspired Delacroix to produce his first major painting: Dante and Virgil in Limbo (1822, Louvre). This painting was accepted by the Paris Salon in 1822 but widely condemned by the public. However, two years later, at the 1824 Salon, he received public acclaim for his work The Massacre at Chios (1824, Louvre). This large painting, inspired by the struggle of the Greeks against the Turks, proclaimed his affinity with the Romantic - as opposed to the Classical - painters, who were then grouped around J.A.D.Ingres (1780-1867), who was himself showing The Vow of Louis XIII (1824, Montauban Cathedral). Delacroix, despite his misgivings, found himself regarded inside the French Academy as the leader of the Romantic school. Delacroix spent the summer of 1825 in England, where - being already knowledgable about the work of John Constable and Richard Parkes Bonington - he studied the works of other artists, and used his skill in lithography to illustrate works by Sir Walter Scott, Shakespeare and Lord Byron. In fact, motifs from Shakespearean plays proved a fruitful source of inspiration until the end of his life: see, for instance, paintings like Cleopatra and the Peasant (1839, William Acland Memorial Art Centre); Hamlet (1839, Louvre); Desdemona Cursed by her Father (1852, Reims Museum). It was in London, too, that he unearthed another source of dramatic subjects when he went to an opera inspired by Goethe's Faust; the series of 17 lithographs that he made the following year brought warm praise from Goethe himself. 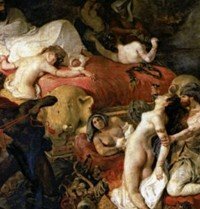 On his return to France Delacroix (inspired by Byron's tragedy Sardanapalus) painted his great romantic work, The Death of Sardanapalus (1827, Louvre), depicting the defeated Assyrian King who watches impassively as his servants, concubines and animals are slaughtered on his order. The painting is both gruesome and beautiful, it is graphic in its scenes of death but beautiful in its sensuous use of colour. Exhibited at the Salon of 1827, the boldness of this work aroused violent opposition from the critics. While working assiduously on portrait art as well as literary subjects - see Assassination of the Bishop of Liege (1831, Louvre) - and history painting - such as Battle of Poitiers (1830, Louvre) and Battle of Nancy (1831, Musee de Nancy) - Delacroix was leading a particularly active social life, meeting people like Stendhal, Merimee and Dumas in the Parisian salons. It was in these circles that he made the acquaintance of the author George Sand, to whom he took such a liking and whom he painted standing behind Chopin as he improvised at the piano (Portrait of Frederic Chopin 1838, Louvre). Around this time be also painted Liberty Leading the People (1830, Louvre). 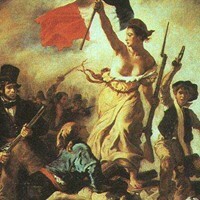 The latter is probably Delacroix's best known oil painting, and depicts Parisians taking up arms with the Tricolour flag representing liberty and freedom in an echo of the Revolution of 1830. The Government bought the painting but soon removed it from public view, deeming it too inflammatory. The work confirmed him as the successor of Gros and Gericault, but with a deeper register. Gifted with a powerful sense of the heroic, in this masterpiece Delacroix converts historical fact into an epic. In 1832 he spent 6 months in Morocco on attachment to the French Embassy. Thanks to the sketchbooks that he kept (two in the Louvre, one in Chantilly) and to his letters, we can follow almost day by day his journey through Morocco, Algiers and Spain, which to Delacroix was a revelation not only of classical antiquity, but also of the magic of colour and light. Indeed, the colours, life and customs of the locals fascinated him, and went on to inspire works such as Women of Algiers (1834, Louvre), The Fanatics of Tangier (1837, The Minneapolis Institute of Arts), Jewish Wedding in Morocco (1841, Louvre), and The Sultan of Morocco and His Entourage (1845, Musee des Augustins, Toulouse). His colourful style of orientalist painting was well received at the Salon, and Delacroix became renowned for his ability to raise the ordinary out of drabness by infusing his compositions with drama. On his return to France from North Africa, he received a number of public commissions such as: the decoration of the Church of St. Denis du Saint Sacrament with a large Pieta; and fresco painting in the Salon du Roi of the Palais Bourbon (1833-8). These commissions allowed him to paint on a large scale, reminiscent of the masters he admired, such as Rubens and Tintoretto. And his love of Renaissance art led him to paint subjects which had been popular at that time including musicians, religious figures, and trompe l'oeil illusionist murals. But throughout this period he never stopped exhibiting at the Salon. Among the historical works he painted at this time, with a view to showing them at the Academy, were Medea about to Kill Her Children (1838, Louvre), The Shipwreck of Don Juan (1840, Louvre), The Entry of the Crusaders into Constantinople (1841, Louvre), The Abduction of Rebecca (1846, Metropolitan Museum of Art, New York), and Michelangelo in His Studio (1849, Musee Fabre, Montpelier). After 1842 he also found fresh themes for his still life painting in the study of nature, and bouquets of flowers - painted mostly at George Sand's house at Nohant. In addition, he displayed Impressionist-like sensitivity in his landscape painting, in works such as The Sea from above Dieppe (1852, Private Collection). Finally, between 1848 and 1861, he produced numerous sketches and paintings of wild animals, such as The Lion Hunt in Morocco (1854, Hermitage, St Petersburg). The last decade of Delacroix's life was marked by three important projects of decorative art; the central ceiling of the Galerie d'Apollon at the Louvre (1850), the Salon de la Paix at the Hotel de Ville in Paris - destroyed by fire in 1871 (but see a sketch of the design at the Musee Carnavalet) - and the Chapelle des Saints Anges at the Church of St Sulpice. In 1855 he exhibited 48 paintings at the World Expo in Paris in 1855, and in 1857, on his 8th submission to the Salon, was finally made a full member of the Academy. In 1859, he exhibited at the Salon for the last time, his last works being Ovid among the Scythians (1858, National Gallery, London) and Erminia with the Shepherds (1858, Museum of Art, Stockholm). After this he devoted himself exclusively to the decoration of St Sulpice, which he finished in 1861, after superhuman efforts. Of the two large compositions that decorate the side-walls of the chapel - Heliodorus Chased from the Temple and Jacob Wrestling with the Angel - the second can be considered as Delacroix's spiritual testament; after it, he was to paint only a few canvases. In 1862 he helped to establish the Societe Nationale des Beaux-Arts, where two societies combined to organise group exhibitions. The writer Theophile Gautier, a longtime friend of Delacroix, chaired the organization and the painter Aime Millet became deputy chairman. 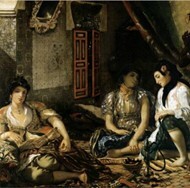 Suffering from tuberculosis, Delacroix passed away on 13 August 1863 at his apartment in Paris. He was 65 years old. The Societe Nationale des Beaux-Arts held a retrospective of his works later that year, exhibiting over 248 paintings and lithographs. He was hugely prolific during his lifetime, creating over 800 oil paintings, 1500 pastel drawings and watercolour paintings, and nearly 7,000 other drawings. He once said "colour always occupies me, but drawing preoccupies me". The last of the great masters in the tradition of the Italian High Renaissance by virtue of his taste for large historical, mythological, religious or literary compositions, and his profoundly decorative sense, Delacroix was also among the earliest modern artists. His studies of colours and their complementary qualities as well as his 'ragged' brushwork foreshadowed the coming Impressionism, and, in particular, his recognition that colour must primarily be representational of light, and that shadow is light's coloured reflection, was of special importance to Impressionist painters. In the same way, his tachisme and the violence of his tones paved the way for important movements of modern art, such as Fauvism and Expressionism. A key representative of Romanticism in nineteenth century French painting, his works influenced a wide variety of artists, including the Impressionists Pierre Renoir and Edouard Manet. Edgar Degas even purchased a painting for his private collection. Paintings by Delacroix hang in the best art museums throughout the world, including the Louvre Museum and the Delacroix Museum in Paris.  For more biographies of 19th century French artists, see Famous Painters.  For information about modernist painting in France, see: Homepage.